WASHINGTON (CNN) -- She is known for her cheery disposition and motherly demeanor, but Christina Romer, the president's chairwoman of the Council of Economic Advisers, is delivering the cold, hard facts on the nation's new jobless numbers. Christina Romer says it will take time for "our three big doses of medicine for the economy" to work. 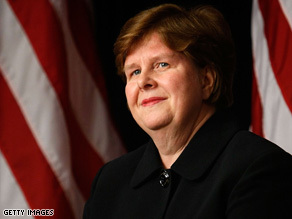 Making her way from camera to camera, Romer is the face of the Obama administration to deliver the bad news. "I think there's no way we could or should spin these. They are terrible. We know that we've lost now more than 650,000 jobs each of the last three months, and that's a tragedy for the American families that are losing those jobs and for the whole economy," Romer told CNN. The U.S. Bureau of Labor Statistics released February unemployment figures Friday, with the jobless rate rising to 8.1 percent from 7.6 percent in January. Romer said the numbers were not surprising. "I think the important thing is they were much of what we expected. But they are still very bad," she said. "The unemployment rate clearly went up a little bit more than the market had been expecting. The job loss is just what we were expecting." Romer, who stands just over 5 feet tall, speaks with pride about being part of a group of academics who've taken time off from their regular duties to work for the Obama administration to tackle the economy. She is a powerhouse player with a doctorate from the Massachusetts Institute of Technology and has numerous books and papers under her belt on the Great Depression. Romer, who was born on Christmas, delivers the economic blows with a kind of optimism not displayed by the rest of President Obama's economic team. Romer said Friday that she is confident the administration is on the right path. "The message I'd like to give to the American people is the president has been so careful to say to the American people, 'We know it will get worse before it gets better.' Precisely because we knew that plans we put in place take time to work," she said. "But they are in place. The fiscal stabilization plan, the financial stabilization plan and the housing plan. Those are our three big doses of medicine for the economy, but they're likely to take unfortunately a few months to work." Romer said she does not believe any one plan is more important than the other in getting accomplished quickly. "I'm actually a great believer that they all need to work at once. That I think they reinforce each other. That it's not, you need to get the financial markets working before the fiscal package does something. I think there's influence the other way. As we get people creating jobs they're more likely to pay their loans, and so the banks are healthier. I think we just got to go through on each one of these simultaneously," Romer said. On a day when Americans are facing the worst unemployment rate in a quarter century, Romer is consistently realistic but rosy. "The president's message is, 'We will recover'. I think that's what the American people need to hear. 'Cause sometimes in the midst of it, it's hard to keep your eye on that, on that hope that is absolutely coming down the line," she said.